Every Monday I will leave you with a Quote Of The Week which will help you kick off your week in a confident manner. Some inspirational words of wisdom that will influence the mind and soul. Or just something that makes me sound cool. To start this off with, I want to quote some song lyrics by the Cro-Mags. 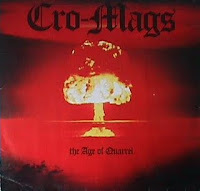 The Cro-Mags are one of my all-time favourite bands and this is one of my all-time favourite records. Besides having written some amazing music, I think what lifts the Cro-Mags way above most bands are their lyrics. I sure can appreciate good music for what it is, but I've always preffered music that came with a message: if you have nothing to say, why say something? Well, John Joseph and Harley Flannagan definitely have something substantial to say, and the following is just one the many great examples of how these uneducated and street-raised survivors still always have been able to define themselves. Expect more worshipping of this band and this record on here in the future, during Cro-Mag Week. It's just unavoidable. Anyway, here's some of my favourite lyrics off this album: 'seekers of the truth'. I live by these words. Cro-Mag Life.